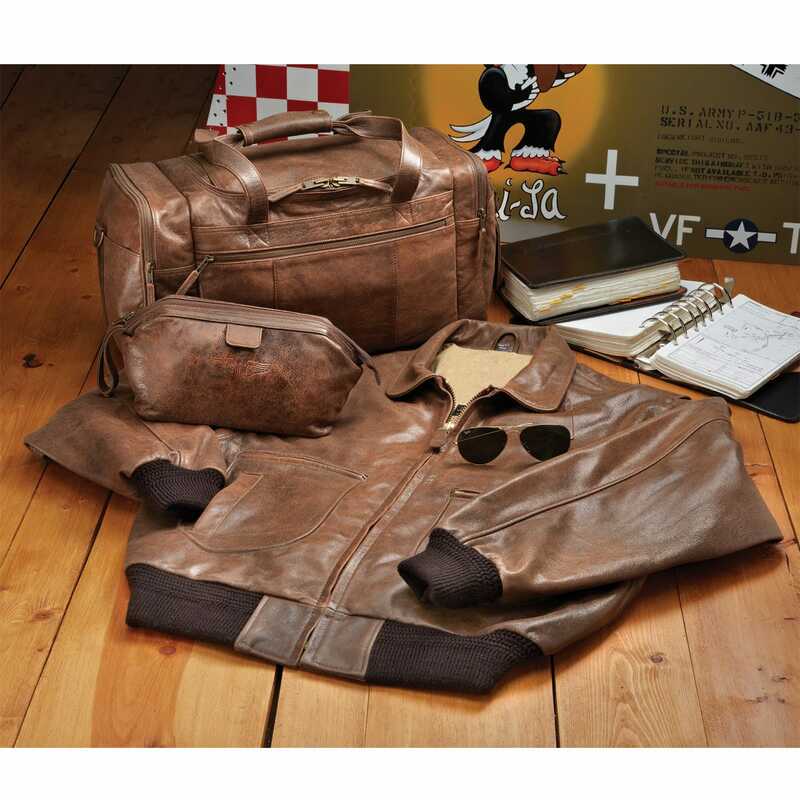 Inspired by the leather jackets and bomber bags used during WWII, this goatskin leather Flight Bag combines a vintage look with modern day features. 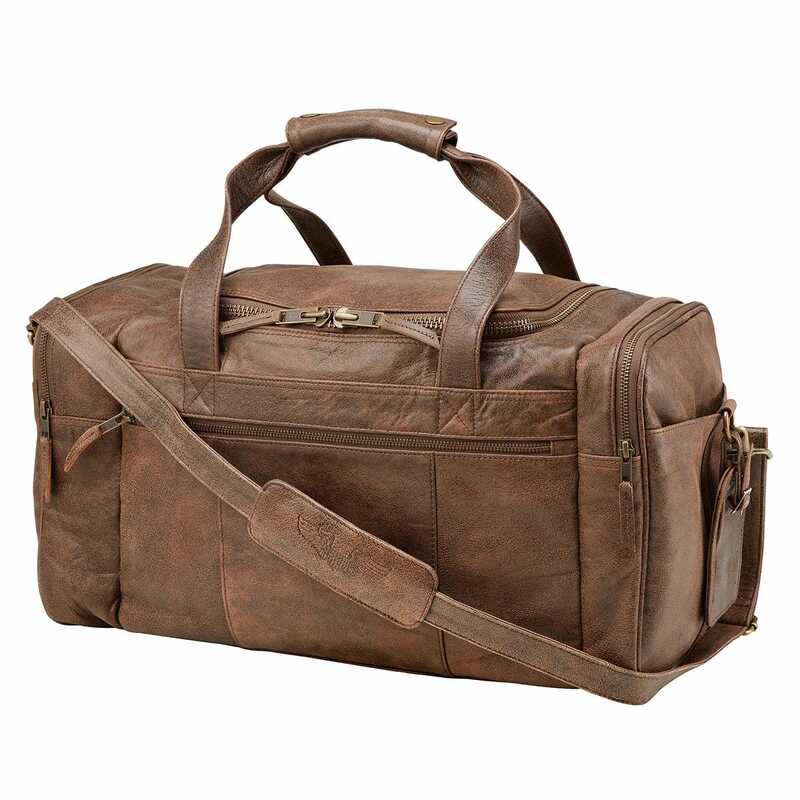 The distressed leather Bag becomes softer with age while the finish acquires a classic appearance. 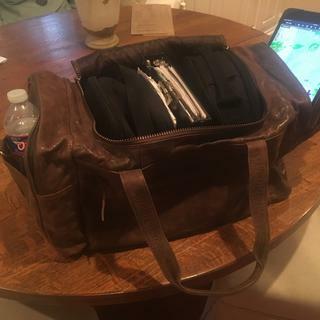 Bag features a large easy-access center compartment that measures 11” x 9”, 100% nylon lining, zippered exterior pockets on both ends, full-length exterior front pocket, and matching leather luggage tag. 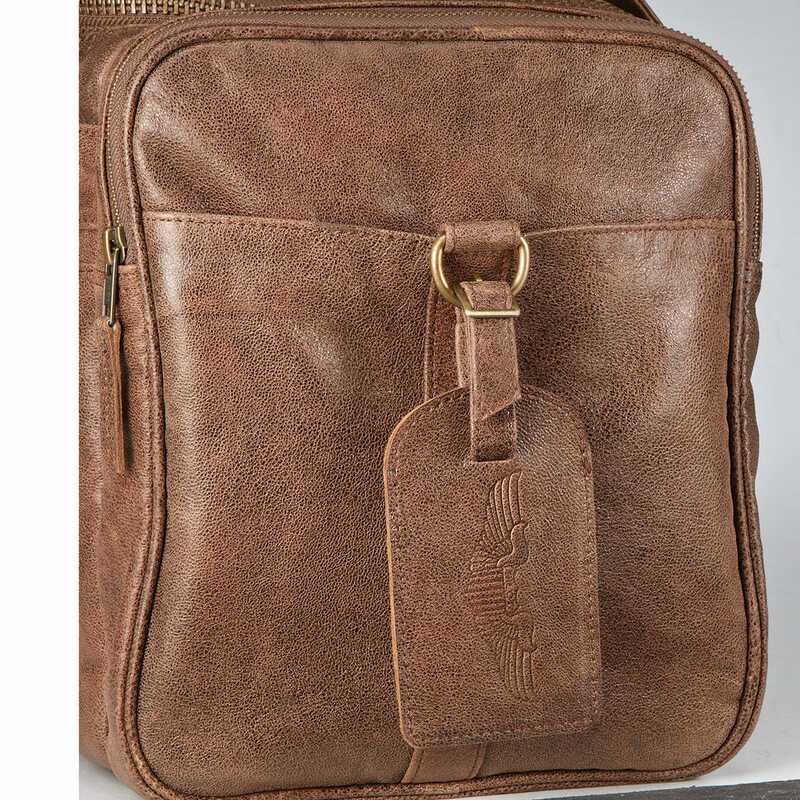 Pilot Wings are debossed on the shoulder strap, inside compartment and on the luggage tag. One exterior end pocket has multiple accessory pockets for pens and cell phone, and is wide enough to hold a tablet. Equipped with heavy-duty YKK zippers, antiqued brass buckles, protective brass feet, snap buttons on the handle and an adjustable and removable shoulder strap. Measures about 19”l x 10”h x 9”w. Very durable!! Nice looking too. I recommend this bag to friends all the time when they are looking for a flight bag. I am hard on bags, and this one can take the abuses. It's a lit smaller than I had hoped, and the zippers are plastic. This bag came squashed, deformed, wrinkled and as if it had come out of a hobo's trolley. Handles crazily kabluey. Had to oil and stuff it to straighten things out. Looks made in China and shipped via Pakistan. The bag was a little pricey but it holds everything I need now including two headsets in their cases, knee-board, Ipad, pens, spare batteries, sun glasses, chargers and cords, hand held radio and still has some room left for a water bottle or other things. What else do you need? I like the look and the smell of the leather. Reminds me of my leather pilot jacket. It's not water proof so if you live in a wet area, you might want to add some mink oil or other leather conditioner to help the leather out. 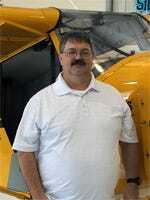 And if and when I have to give up flying, I hope God takes me before then, it will work well as an overnight bag or airline carry-on. The leather is very soft and supple, I left it in my car and it made the car smell like a fine European luxury car, (Volkswagen). 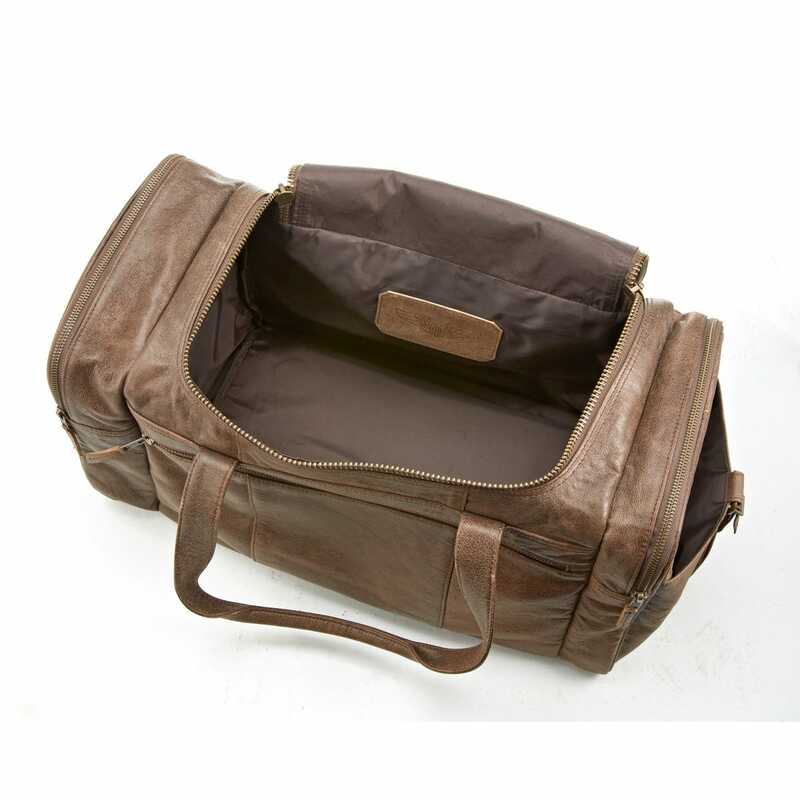 There is so much space in this bag it would be easy to fill it up with all your pilot gadgets. Ordered for Christmas as a present and arrived on time. Returning SPORTY'S CUSTOMER SERVICE RESPONSE Thank you for the review and we're sorry you don't like it. 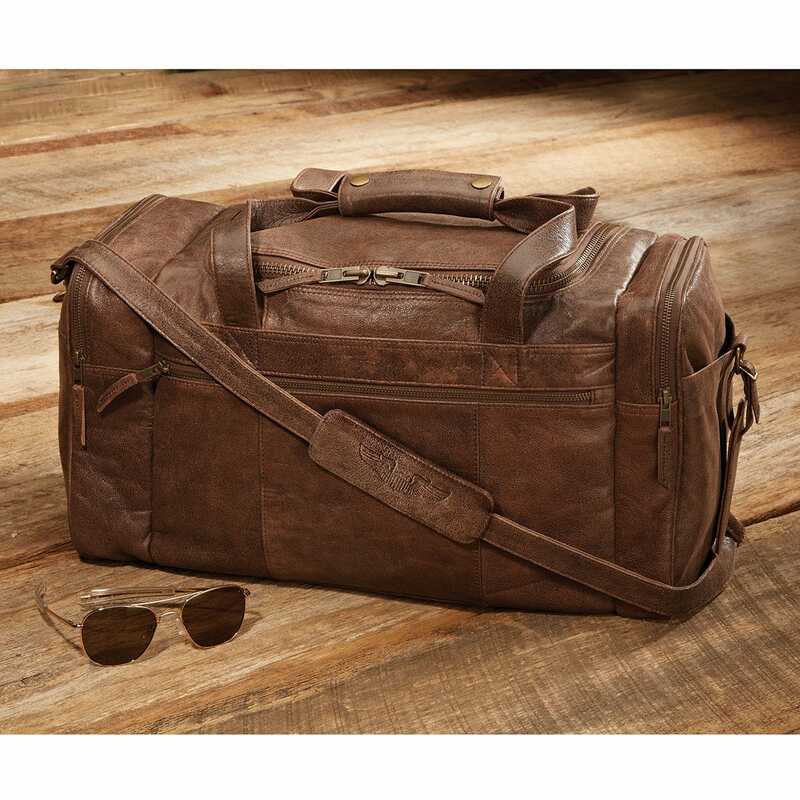 It is 100% genuine leather that is antiqued to be soft and supple. As always, we gladly accept returns.